As a Social Studies teacher, I consistently struggle with how to make my content exciting during those direct instruction days that seem to drag on. My first encounter with Pear Deck was at the EdTechNJ conference last year after a long day of various ‘sit and get’ style sessions. I loved the opportunity to participate and make my learning a truly fun and interactive experience. When I introduced my students to PearDeck, they had the exact same reactions! Pear Deck is a GAFE integrated formative assessment tool that combines a presentation (Slides, PDF or PowerPoint) with various styles of assessment questions - Multiple choice, text, or really awesome and creative options to drag a bullet or icon to choose an answer. The platform requires a 1:1 or BYOD environment and while most of my students have smartphones, they opted to use either an iPad or Chromebook for the larger screen. Students can either go to peardeck.com/join and type in a five letter code (which Pear Deck helps you to remember with a hilarious and adorable phrase) or you can invite students directly from Google Classroom. After students log in, that’s when the fun begins! *Note: Pear Deck was kind enough to give me a Premium account for one year, so all experiences are based on my useage of the paid version. However, I absolutely plan on purchasing the Premium version on my own after the year is up! Seamless integration with GAFE tools. This is a huge time saver that makes using Pear Deck quick, efficient, and easy from login to completion of each session. One of the most awesome features is the capability to share the results of each student’s progress with them individually via the ‘Share To Classroom’ extension. Student voice. Many of my Special Ed students are hesitant to participate in class whether due to anxiety, lack of confidence/motivation, or other reasons. Pear Deck gives even the quietest student a voice and holds them accountable for their learning. Furthermore, students take pride in seeing their answers displayed on the projector - A definite win for everyone! Aside from the fact that all answers are displayed anonymously, you have the option to choose which specific student responses are shown. Instant data. Built in opportunities for flexibility, adaptability and scaffolding using the ‘Ask A Quick Question?’ feature are huge for gathering authentic and real-time data about student understanding - and for all students, not just the ones that volunteer and raise their hand. 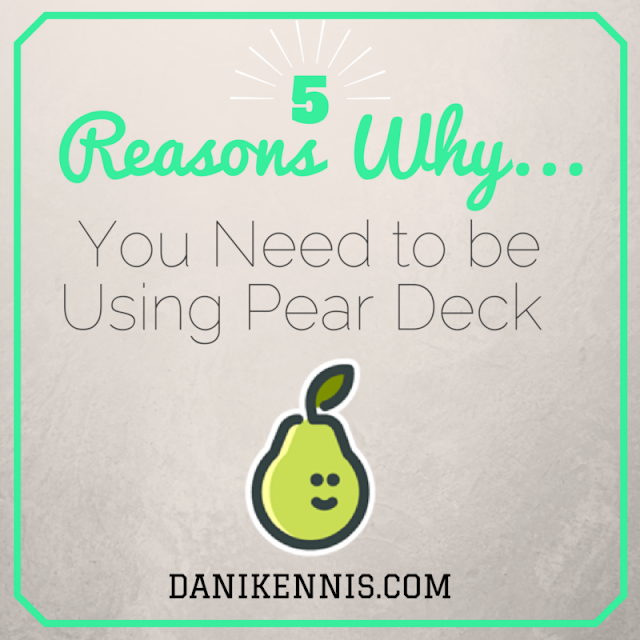 Teachers also have the ability to lock the student’s Pear Deck screen (you’ll almost always hear a ‘Nooooo! Come on!’ at that point because they <i>love</i> playing with the different pointers and bullet marks) to maintain focus and bring the attention back to the lesson. Gamification. Competition breeds excitement. Any day when there is that tangible buzz in class is a great day, which is exactly what happens on Pear Deck days! Even though there aren’t prizes, students love being able to interact with the information being presented in an active way that feels competitive, collaborative and fun. Increased motivation and engagement. 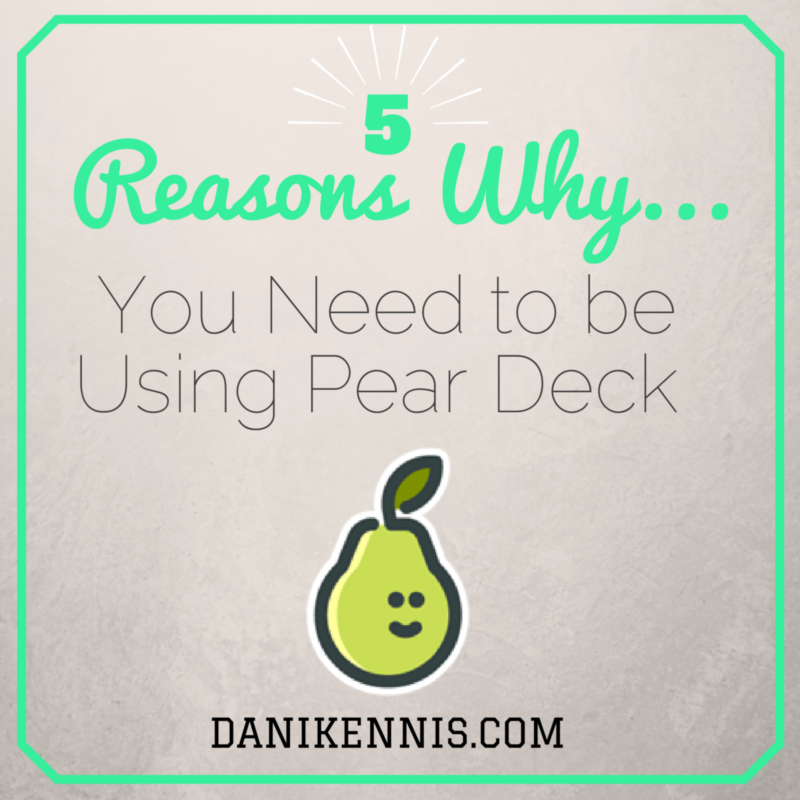 By the end of the period students are always begging me to use Pear Deck with every presentation that we do. They loved the interactive nature of the lessons and I never have behavior issues on Pear Deck days. I find that Pear Deck enhances student focused and most certainly energizes my students, just adding to the least of reasons why it is such a valuable tool! 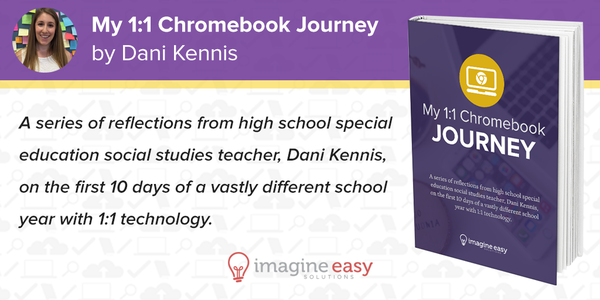 I am so thrilled to announce that my Imagine Easy series of 1:1 Chromebook Journey diary entries on the Imagine Easy blog have been published and turned into a free eBook! Click the link for the final part of my Chromebook journey thus far. Please check it out and give me your feedback. I would love to hear from those of you who are also in 1:1 classrooms, and even those of you who aren't yet but have ideas about what to do when you get there. Thank you so much for reading and giving me some awesome feedback so far. I can't wait to connect with more of you! Casual setting. The cozy and laid back atmosphere of a coffee house is the perfect intimate forum for informal conversation. It lends itself to connecting with new and old friends, especially on Sundays as we relax and recharge before another week of work. Informal, unplanned conversation. I love the idea of going into a CoffeeEDU and not knowing where the conversation will end up. In my experience conversation has shifted from our major edu-wins in our classes or jobs, to job opportunities, to struggles in which participants saught out advice, to the latest EdTech trends. Today, we started with introductions and then our crowd of 15 broke off into various smaller side conversations that everyone jumped in and out of with ease. Connect with local educators face to face. Teaching can be an isolating profession. We spend the day in our classrooms but often don’t have the opportunity to connect, reflect, or exchange ideas with one another beyond faculty meetings or our lunch period. Moreover, as a passionate EdTech integrator in a school/district that is fearful of change, it is liberating and validating to be surrounded by fellow forward thinking individuals that share my vision and passion. Learn about something new. At today’s CoffeeEDU the fabulous Maker Space Queen, Meredith Martin, showed off the 3D CreoPop pen which uses a heatless UV light to create 3D objects. Check out her awesome demo on Periscope! Tribe of weirdos. There is no better feeling than connecting with a diverse group of people that share the same talents and interests as you. Attendees of CoffeeEDU are passionate about education and creating proactive positive change in the education world. I left today feeling energized and excited to share my experience with my broader PLN and I can't wait to connect again with many of today's CoffeeEDU attendees at EdCampNJ! I want you to have the same amazing experience that I did! 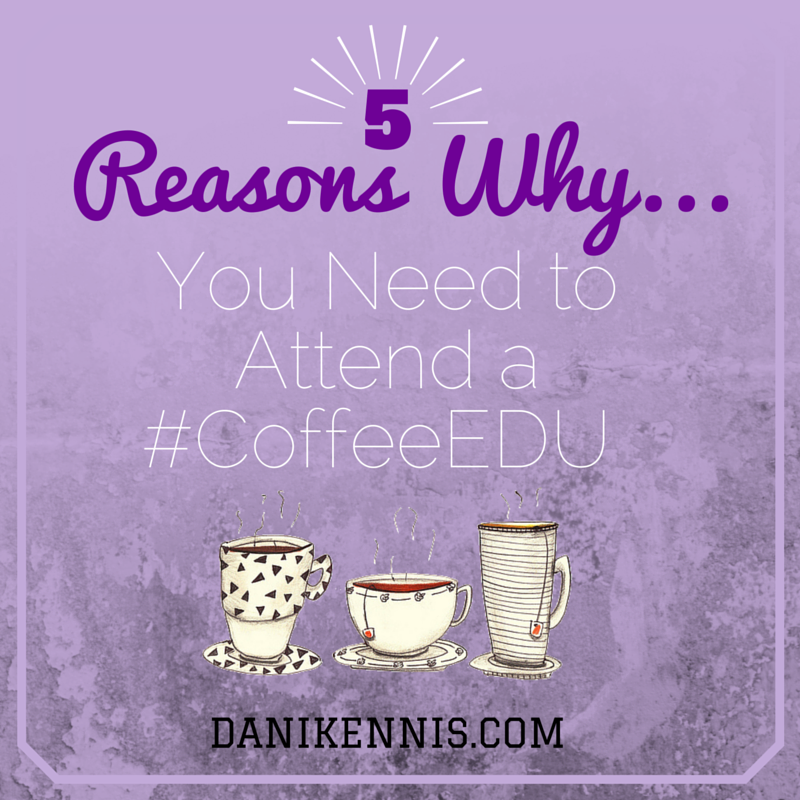 Looking for a CoffeeEDU near you? Jump on Twitter and use the #CoffeeEDU hashtag to connect with like-minded educators that also want to connect! I'd love to hear your CoffeeEDU stories and experiences - Share with me on Twitter or in the comments below.